On 12 December, DMSC members arrested some alleged ISIS members in Derna including Mahmoud Mohammed al-Souainay. On 14 December, DMSC fighters arrested Souhail Rizk al-Oakley, in al-Maghar area in the centre of Derna, for the second time. On 13 December, reports indicated that the body of a young man which showed signs of being executed was found in Nufaliya, a town east of Sirte. The Derna Mujahadeen Shura Council (DMSC), the jihadi organization that controls the besieged city of Derna, stepped up its anti-ISIS operations throughout last week, arresting former ISIS members who had previously been detained or absorbed by the DMSC, and clashing with others. On 17 December, fighting between the Libyan National Army (LNA) and DMSC fighters east of Derna is reported to have left one LNA fighter dead and another wounded in the Kassarat area. 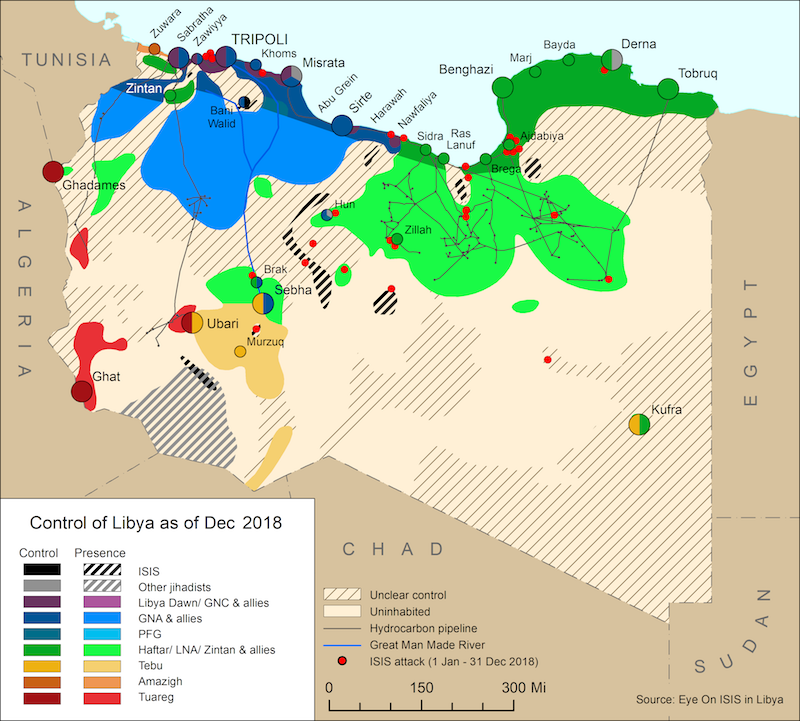 On 17 December, a new joint statement was issued by the regional troika, Tunisia, Egypt and Algeria, reaffirming their full backing to the Libyan Political Agreement (LPA) and the military unification process. A statement issued by the UN Security Council President on 15 December, as well as statements by the UN envoy Ghassan Salame throughout the last two weeks, maintain that the 17 December date was a ‘non-date’ and that the LPA remains the only legitimate political framework. On December 12, Russian Foreign Minister Sergey Lavrov held talks with the GNA Foreign Minister Mohamed Siala in Moscow. 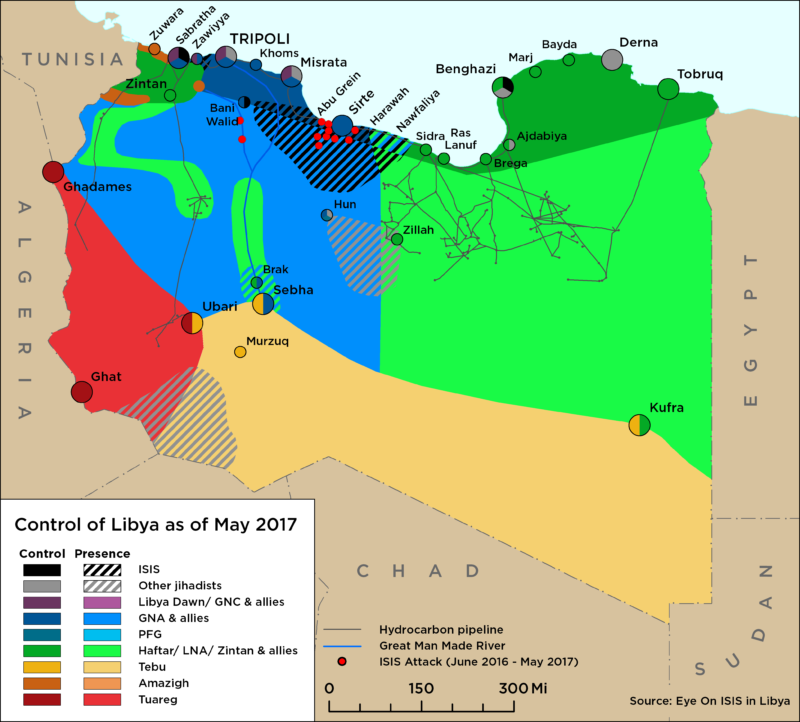 The 17 December ‘expiry’ date of the LPA was marked by an official television announcement from Khalifa Haftar declaring the LPA and its institutions expired. Haftar also endorsed ‘elections’ as the only legitimate expression of the Libyan people’s will. The same day, Misrata’s municipal mayor Mohammed Eshtewi was abducted and killed shortly after landing in the city on a flight from Turkey.